Communicating science is part of a researcher’s everyday life: Through public talks, interviews, social media, and more they share the process of conducting research and their findings with non-scientific audiences. Yet most scientists don’t receive formal training in how to clearly and concisely talk about their work with those outside the scientific realm. 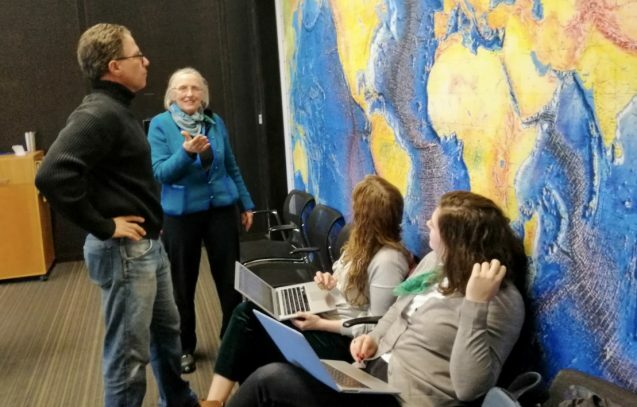 On February 21, Columbia University scientists learned the essentials of science communication during a half-day workshop at Lamont-Doherty Earth Observatory. The event was led by Daniel Goleman, author and science journalist formerly of The New York Times, and David Shipley, chief editor at Bloomberg Opinion and former opinion editor at The New York Times. The two experts discussed how scientists can translate their research into engaging communications for the public, including successful opinion pieces, to a large group of researchers from diverse fields of study. An interactive component allowed scientists to practice their new communication strategies with their peers. Peter de Menocal, director of the Center for Climate and Life, invited Goleman to co-lead the workshop.